Philadelphia— Toronto FC were victorious when they kicked off their 13th MLS season on Saturday afternoon thanks in part to a brace from captain Michael Bradley. Toronto were looking start the season on a positive note after a disappointing CONCACAF Champions Leagues exit that saw them lose 5-1 on aggregate, and they did just that. 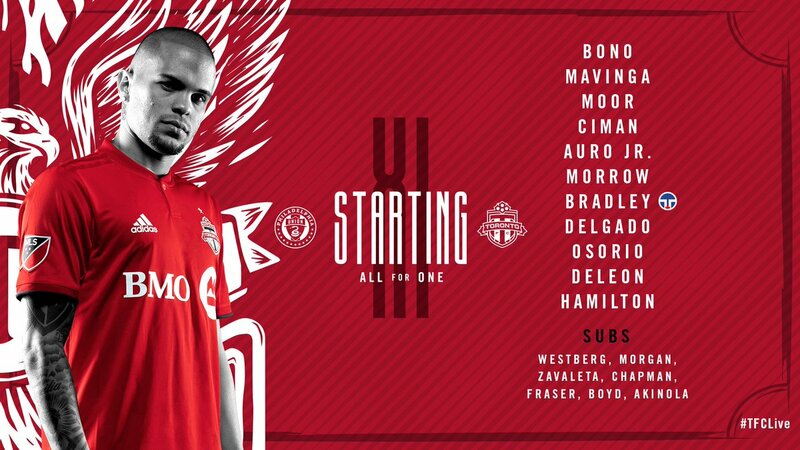 Coach Greg Vanney went with a different formation for Saturday’s game; he used a 3-4-3 formation with Chris Mavinga, Drew Moor, and Laurent Ciman on the backline, Justin Morrow, Michael Bradley, Marky Delgado, and Auro Jr. in the midfield, and Jonathan Osorio, Nick DeLeon, and Jordan Hamilton at forward. Although the team played in a 3-4-3, Morrow and Auro Jr. playing in the midfield allowed Toronto to adjust to a 5-2-3 when they don’t have the ball because both play primarily as fullbacks, which provides the team with a strong defensive presence. Toronto FC were awarded a penalty kick after Auro Jr’s shot was stopped by Union defender Wagner who had his arms up when sliding in. Fortunately for the Union, Jonathan Osorio’s penalty was stopped by goalkeeper Andre Blake to keep the game tied 0-0. Toronto FC have now failed to score twice in their last three games, which is concerning because Sebastian Giovinco was relied on last season to take penalty-kicks and with Altidore absent from the lineup, they haven’t been successful from the penalty spot. In the 45th minute, Toronto had great scoring opportunity after a through ball found Jordan Hamilton, but he struck the ball wide. This was a great sign for TFC because they hadn’t looked promising offensively during their Champions League games, so this was something positive that the team could build on going forward. During stoppage time in the first half, Toronto took advantage of the Union being out of position after Auro Jr crossed the ball to captain Michael Bradley, who scored to put his team up 1-0. This goal was significant for Bradley because it was his first goal since 2016, which can be a great confidence booster for both himself and the team. Toronto FC had a much better start to the second half than they did in the first half; they weren’t out of position and maintained their formation. That great start continued into the 62nd minute, Bradley to score his second of the game on a perfectly placed shot following a rebound that left him wide open in the Union box. Philadelphia’s luck would turn around when midfielder Marco Fabian successfully scored a penalty kick to put his team within one following Osorio’s handball in the penalty area. The Union had the momentum following the penalty kick and were close to tieing the game but luckily for Toronto, Ciman would clear the ball from the goal line after a chaotic scrum in the box, keeping the game 2-1 in favor of TFC. Nick DeLeon sealed the win for his new club, when he scored in stoppage time to make it 3-1. It was a gritty win for Toronto FC that’ll surely give them confidence heading into their home-opener on March 17th when they play the New England Revolution.